With room for five thousand people, and housing twenty restaurants and over forty artisanal food stalls, the massive Mercado do Porto Carioca (Porto Carioca Market) food hall will be the new focal point of Rio de Janeiro's thriving culinary scene. RIO DE JANEIRO, BRAZIL – Praça Maua in Centro will soon be the destination for food enthusiasts throughout Rio de Janeiro as the Mercado do Porto Carioca (Porto Carioca Market), a new six thousand square meter gourmet food hall showcasing the best of Rio’s culinary scene under one roof, is set to open next November. The new Mercado do Porto Carioca (Porto Carioca Market), set to open in Praça Maua, was inspired by Portugal’s Mercado da Ribeira (pictured above), photo internet recreation. Inspired by the famous European food markets, such as the Mercado da Ribeira food hall in Lisbon, Portugal, the ambitious project is the creation of the BestFork Experience restaurant group who invested R$45 million to transform the historic Touring Club building and terminal at Praça Maua in Rio’s revitalized Port Zone into the massive food hall. 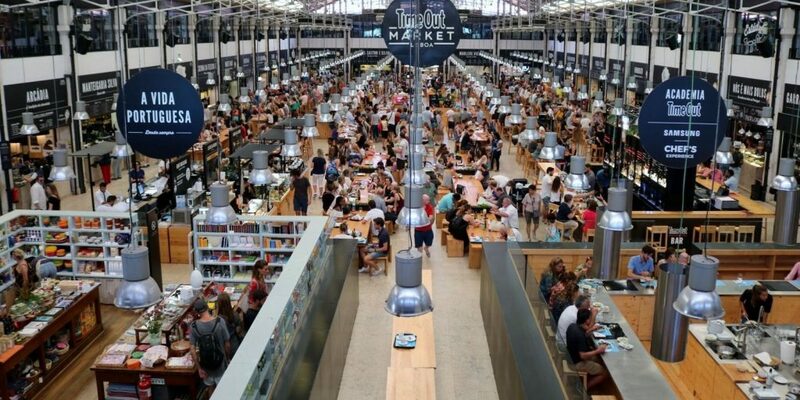 With room for up to five thousand people seated at large communal tables, the Porto Carioca Market will house over twenty restaurants, forty artisan food stalls, two craft beer breweries, and two outdoor bars. According to Torres, the plan is to feature a diverse mix of Rio’s more well-known establishments alongside more casual food vendors. In addition to gastronomy, the iron-clad market hall will also have space for cultural events and shows, as well as cooking classes and other presentations. The Porto Carioca Market food hall will open in the Touring Club building and terminal, an elegant art deco structure, which, since the reconstruction of the Port Zone area and the Rio 2016 Olympic Games, has played host to numerous food fairs and cultural events. “For the tourist and the carioca, these places of strong architectural appeal need special attention like this,” said Riotur president Marcelo Alves.